The early Deal registers give little personal information, just neatly written lists of names. But occasionally we get additional details, perhaps from a marriage licence, giving age, occupation and parish of origin. So, while we have little for this generation, we know that Henry May came from a line of Deal boatmen and that his male descendants were boatmen too. It seems safe to assume that this was also Henry’s occupation. Lydia Hagon also came from a seafaring family. But, though she was born and brought up in Deal, her father was a mariner from Great Yarmouth in Norfolk. HENRY MAY was baptised in Deal on 9 Nov 1712, in the reign of Queen Anne. His parents were John and Susannah May. Henry was either an only child or the eldest of a family of seven, depending on whether John and Susannah May are the same as John and Sarah May. We have not found the marriage of John to either Susannah or Sarah, so we do not know the surname of Henry’s mother. Since the marriage is not in the Deal register we may assume that his mother came from another parish. LYDIA HAGON was baptised 22 Oct 1710 in Deal, the daughter of John and Mary Hagon. In the parish register her name is spelt Lidea. Her father was a mariner from Norfolk. This is evidence of how far seamen travelled around the North Sea coast. Her mother was Mary Scott of Deal. John Hagon settled in Deal and brought up his family there. Lydia was the youngest of six children. The couple married in Deal on 25 Nov 1736. Lydia’s surname, which occurs in many forms, was here given as Haggon. They had one son and two daughters. 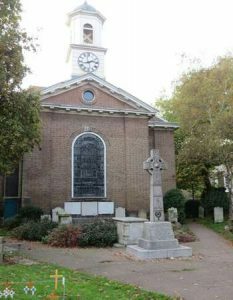 Henry was buried on 12 Oct 1783 at St George the Martyr. This was the chapel of ease in Lower Deal used by most of the boatmen, who lived closer to the sea than to the parish church of St Leonard’s a mile away on the hill. It was built 1706-1716. The sexton’s notebook records that Henry’s grave was “21 foot in the field opposite the 12 Tree South Side.” He gives Henry’s age as 71. His burial is listed as “Parish (no tax)”, suggesting that he was given a pauper’s funeral. Older people often fell into poverty when they were no longer able to work. is given as 88, though she was in fact 83. Not many people’s ages are recorded. She may have been felt to have reached an unusually late age. Her burial is not listed as being on the parish. It may be that after Henry’s death one of her children, possibly John, took her in. The following year, Lydia’s 7-year-old grandson John May was buried at the foot of her grave. St George’s. The war memorial is more recent. The Deal burial register includes many listed as “Stranger” or “drowned”, reflecting Deal’s position close to the notorious Goodwin Sands where many ships met their end. Baptisms, marriages and burials are taken from Canterbury Diocesan records, accessed through Findmypast.